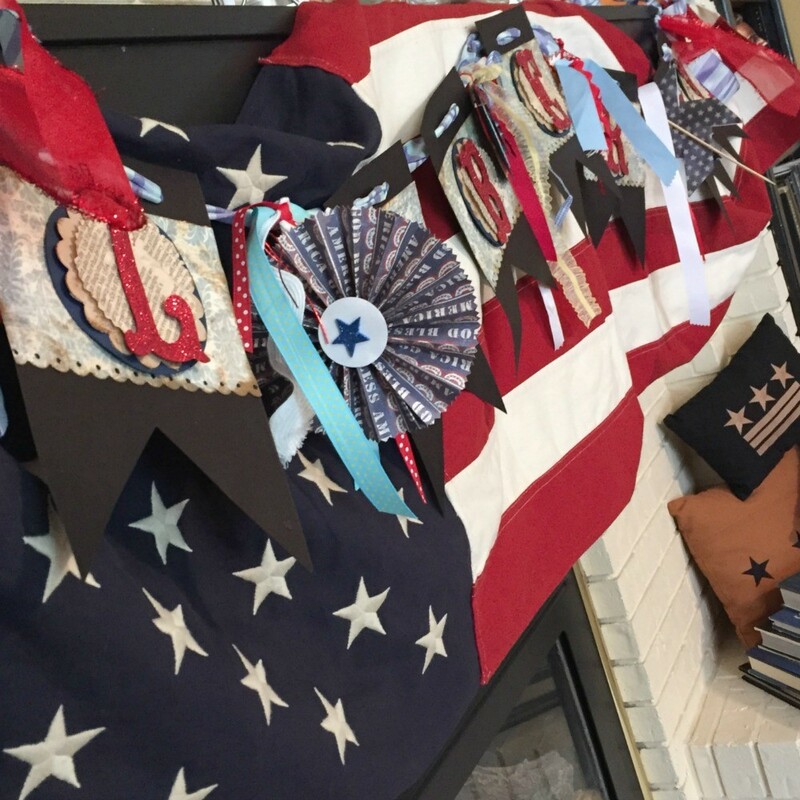 Our National Birthday is only a few days away and I’m busy prepping for this fun celebration. I’m not ashamed to admit, I thoroughly enjoy our patriotic colors and have been wearing them daily. I find it’s fun to add just a little of the red, white, and blue theme. A surprise element like possibly just one blue finger nail? Or a few added blue bracelets. I’m still keeping to my addition of yellow. My front porch is now ready to welcome family and friends . . .
as well as a few vignette’s throughout my home. 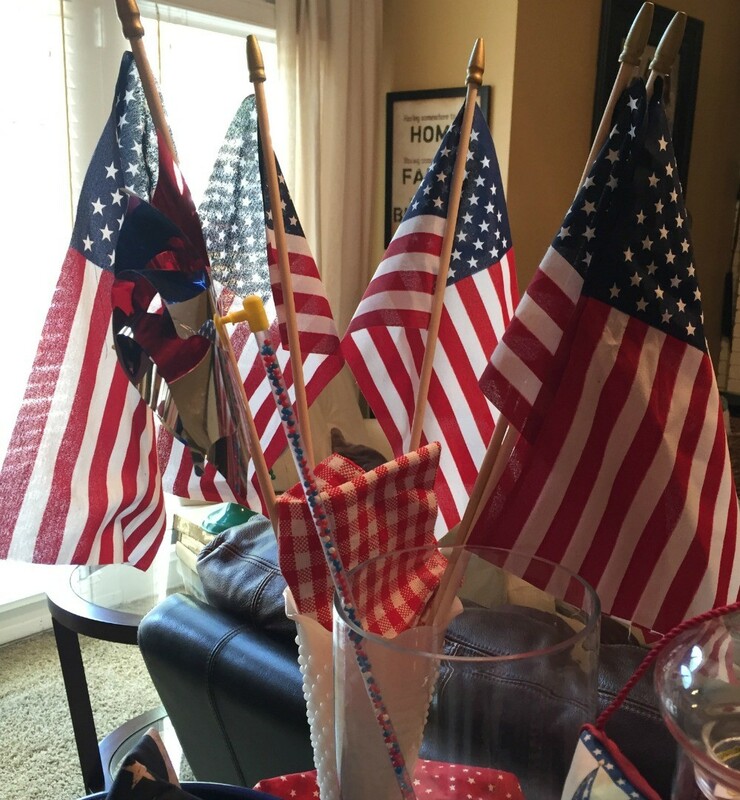 Since we’ll be hosting our annual family and friends swimming and BBQ party I’m now excited to put together an all American style attire, this will be so fun! 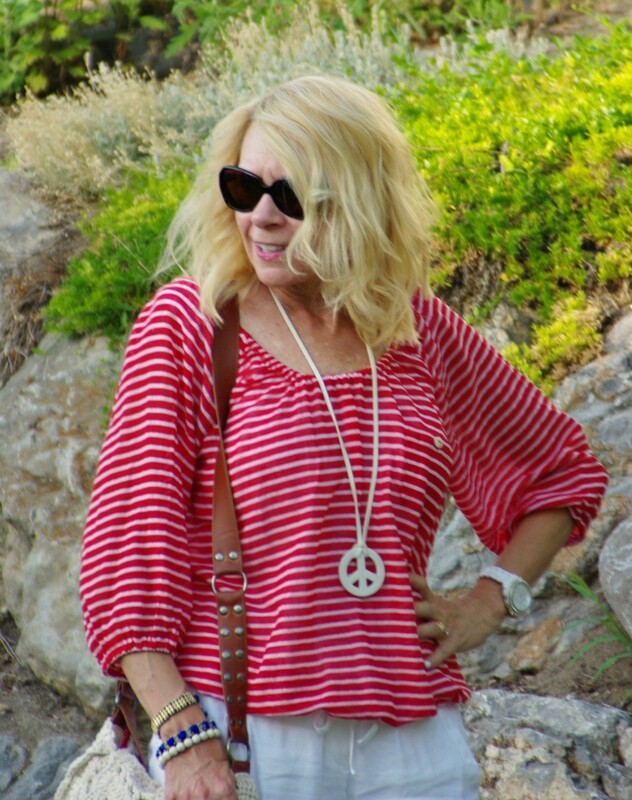 Although if you want some really great inspiration, go visit my dear friend Tamera’s site, its full of how to shop your closet for this celebration. I’m off now to get that outfit together (can’t wait to show you the skirt) and lots of fun food ideas as well as one great hostess gift for attending a summer BBQ. As always my friends, thanks for dropping by. Have a most wonderful day! So fun!! I love the fingernails too!! 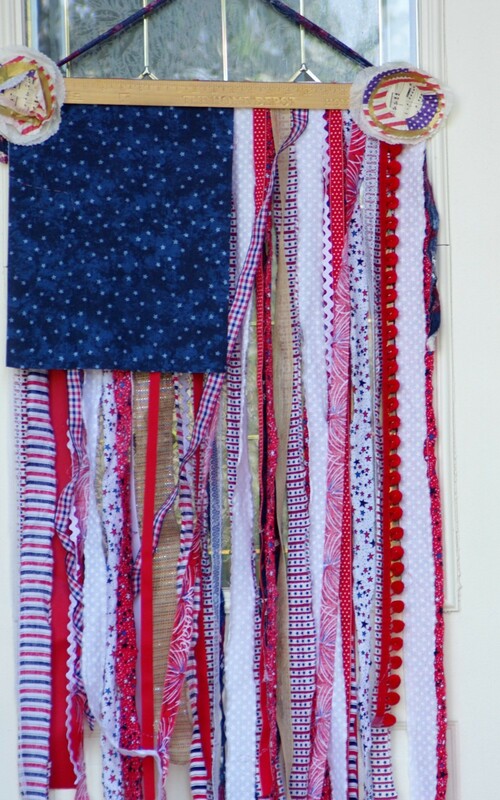 I LOVE that version of the flag made with trim and fabric. How creative! It would be too difficult to do the same for a Canada Flag though. Darn. Oh my gosh, you look cute girl! 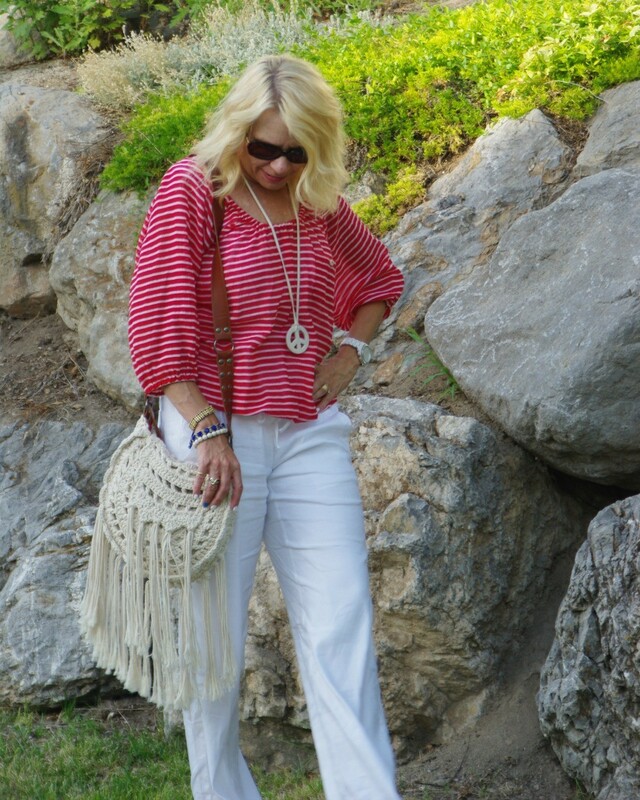 Love the top and the purse is so much fun!! 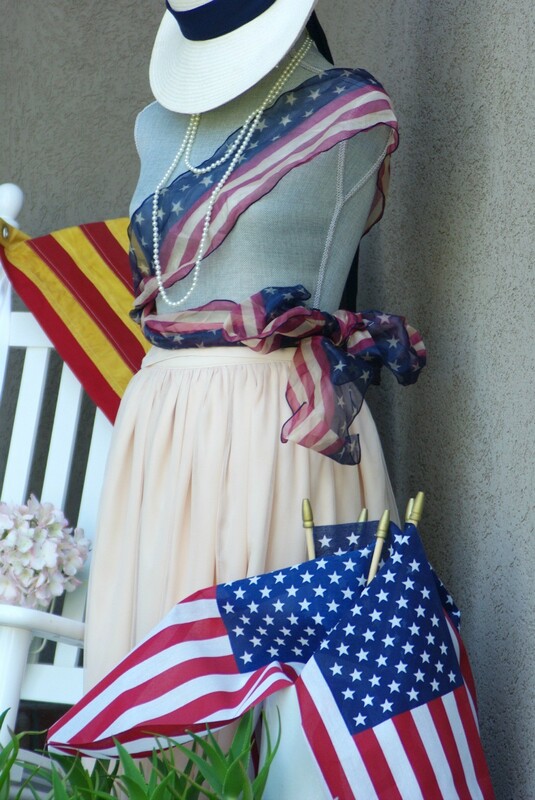 Love your mannequin on your front porch. May have to pull one out on mine for next year. Everything looks so festive! Have a fun party! We will be hosting our annual 4th of July breakfast. Can’t wait to celebrate with my family in your beautiful backyard. With temps expected to be 100 +, you are going to have to drag great grandma out of the pool to help with dinner. As always everything looks so very festive which makes the party so much more fun. Thank you darling for all your hard work and appreciate the person you are. Proud to be an American and the mom to this amazing family. With that necklace and bag you are right back into the seventies. You were too young to really remember weren’t you? Love the red white and blue outfit. And you have outdone yourself again with the porch. 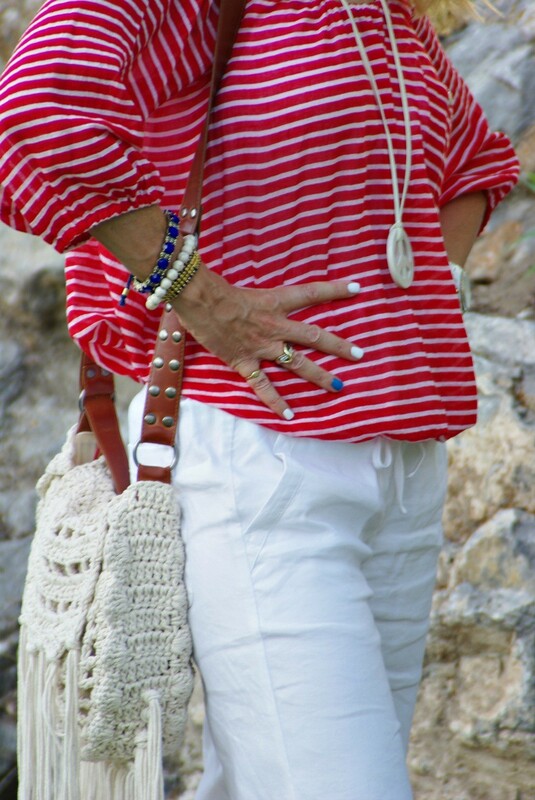 I have really enjoyed wearing red, white & blue all last week – it’s one of my favorite color combos. 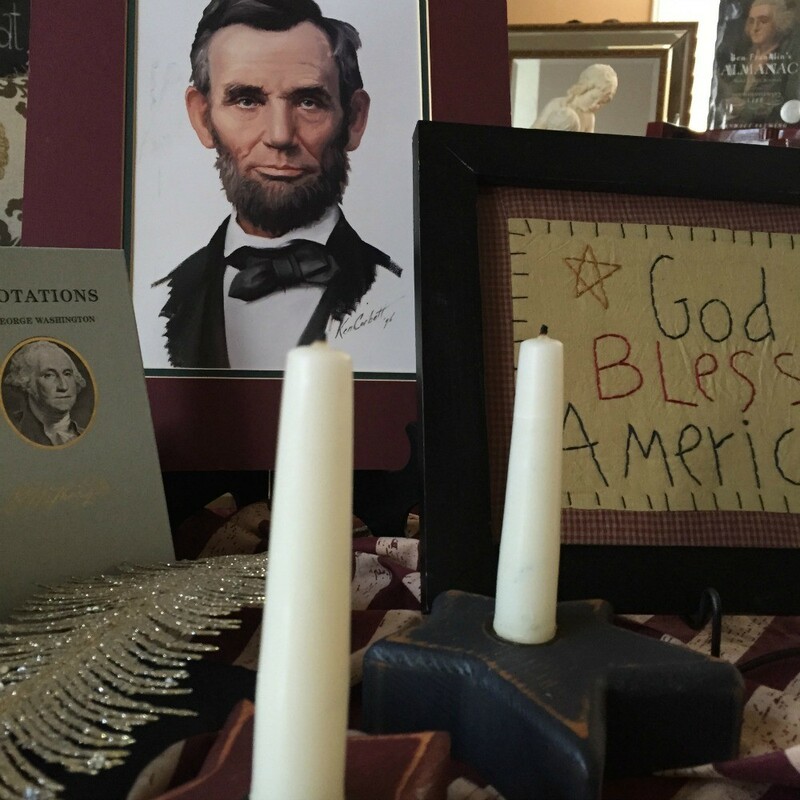 I love all the Americana decor in your home! Thank you for joining TBT Fashion link up and hope to see you Thursday.